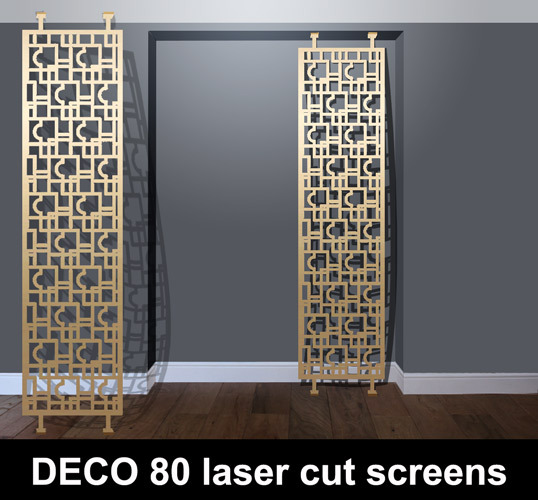 Decorative room divider screens and room partitions in modern laser cut metal designs. Custom made room dividers and modern interior screens in a huge range of design styles and patterns. Choose from modern abstract patterns, art deco designs, moroccan and arabic styles, geometric patterns and many more. We manufacture beautiful bespoke room dividers in lots of designs to your colour and finish. Perfect for modern and contemporary homes our room dividers can be fixed or removable depending on your requirements. Manufactured in the UK by our award winning design team we work with home owners as well as interior design consultancies and architects to create stunning interiors. Choose from the wide range of patterns below or send us your ideas and we will do the rest. Please fill in the form below with your requirements and one of our design team will contact you immediately. Alternatively ring 01476 589221 for an informal discussion. Please note we never spam or pass information to third parties.